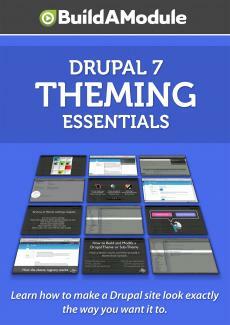 I'm Chris Shattuck and this is "How to Work With Drupal Theme Settings". In this chapter, we are going to talk about theme settings and how to add new theme settings to our theme. In this chapter we are going to be talking exclusively about theme settings. In previous videos we discussed how to add a theme setting through your theme settings dot PHP file and we looked at how to set a default for those settings. In this chapter we are going to expand that a bit and add our own theme setting and talk about that in detail but we are also going to go over the default theme settings for a Drupal site, what they all mean and how theme settings cascade from the global settings into the themes specific settings and how to make sure that you understand which theme settings are being used in a particular situation. Finally what we'll do is go over the color module and how to integrate color settings in with your theme. Let's begin by looking at the theme settings available to us, both globally and specifically for each theme. Now what I've done is gone to the appearance page by clicking on the appearance link in the menu and I've enabled the Bartic theme as our default theme so you see here that Bartic 7. 0 is the default theme. Now we have two themes going on right now. In the front end we're using Bartic, but then in the back end, I'm going to scroll down here to the very bottom, we have our administration theme set to seven. Now this is just the Drupal default setting. We have seven as the administration theme and Bartic as the front end theme. By having separate themes for the administration side and the front end side, it enables us to clean up the interface or optimize the interface for particular situations. For example, in the administration theme, we don't necessarily need the same kind of branding. And so if we scroll up to the top you see that we don't actually have a logo appearing here. Whereas if we go to the home page. What I'm going to do is go ahead and open up the home page in a new tab. On the home page we do have a logo and that makes sense for the front end of our site. So as we make changes to the settings it is important to understand that this delineation that we may be making changes to one theme but not to another. Ok. I'm going to jump back to the administration page for our themes. And lets go ahead and look at the global settings available to us. And I'm going to get there by going to this settings tab on the appearance page. Ok. Let's look at this top section here called "TOGGLE DISPLAY". This is a set of check boxes that allow us to turn specific elements of a page on and off. And a lot of them are straight forward but a couple of them could do with a little bit of explanation. The logo is of course the logo for our site that appears in the upper left hand corner of the page in most cases. The site name is the heading that appears to the right of that logo as we look at the Bartic theme.